The coconut grows on the coconut palm tree, which thrives in tropical climates. While coconuts are a large part of the diet for many people who live in tropical regions, many people from colder regions have never eaten raw coconut meat. Although the meat can be difficult to remove from its hard shell, it is often sold in grocery stores without the shell and can be eaten plain or shredded onto salads and other dishes. One cup of raw coconut flesh contains 283 calories, most of which come from its 26.8 grams of fat. While most plant foods contain very little saturated fat, coconut meat contains a large amount, with 23.8 grams per cup. However, unlike other saturated fats, which are long chain fatty acids, most of the fat in coconut is a medium chain fatty acid. Medium chain fatty acids are broken down much faster than long chain fatty acids, so they do not contribute to high cholesterol, as long chain fatty acids do. 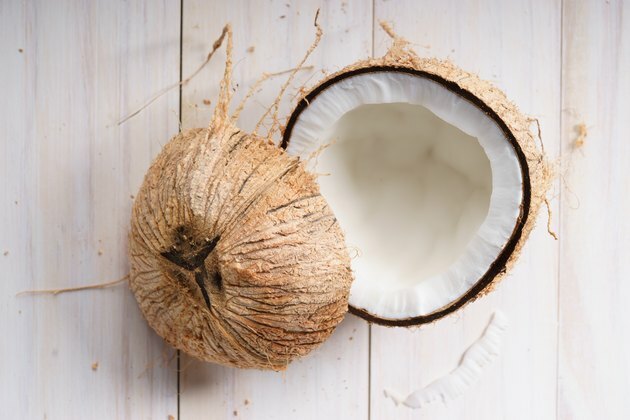 According to a study published in 2018 by Journal of Food Science, the fat in oil derived from coconut meat contains antioxidants that help boost the immune system properties that help reduce inflammation in the body. According to a review published in 2016 by Natural Product Communications, research performed mainly on animals suggests that coconut oil might improve blood pressure, reduce abdominal fat and cholesterol levels, as well as stabilize blood sugar levels. Despite these possible benefits, if you have high cholesterol or heart disease, you should check with your physician before consuming coconut meat or any other food high in fat. One of the benefits of coconut meat is its fiber content. One cup contains 7.2 g, which is more than 20 percent of the recommended daily amount for most adults. Fiber assists in the digestion process by adding bulk to the stool, which helps to move food through the digestive tract. Fiber can also help you feel full, which is important if you are trying to eat less to lose weight. According to University of California San Francisco Health, 25 to 30 grams of fiber should be consumed from food items each day. Coconut meat is high in the trace mineral manganese, with one cup providing 67 percent of the recommended daily amount for women and 52 percent for men. Manganese helps you metabolize both fat and protein. It also supports both the immune and nervous systems and promotes stable blood sugar levels. Manganese also helps your body use other nutrients such as iron, thiamine and vitamin E.
Coconut meat provides a significant amount of two other minerals: potassium and copper. One cup provides 14 percent of the recommended amount of potassium and 39 percent of copper. Potassium, along with sodium, is essential for proper fluid balance within your cells. It is also necessary for proper heart function and muscle growth. Copper is important for the production of red blood cells and assists with your sense of taste. What Are the Benefits of the Cashew Fruit?